Oh, the thread's unlocked now. When the plot synopsis was originally unveiled on the "June Episodes Announcement" thread, I was skeptical on whether fitting a "diabolical scheme" would actually work. Now that the episode has aired, I think they pulled it off. I was worrying this would just be banking off of Spot's amoebas for a cute factor and it'd be a stupid "Plankton steals the formula episode" with little to no humor and extreme season 10 wackiness, but it was actually creative, and there was a balance of humor such as Patrick being Mr. Krabs pets, Plankton taking over the girl scout area, and Plankton's agression at the supermarket. I felt it'd go slow at first and have a pacing issue but it worked really well. I'd like this to be the direction that s11 goes in compared to season 10's insane wackiness. It felt natural, and kept a simple story with well done execution. That's something which has been rare as of late. I'd like to see more of Spot and the amoebas later. Sort of worthy sequel to Plankton's Pet. It didn't have enough Spot sadly but Spot's babies were so adorable enough that I can pass. Not only that. Unlike Bubble Buddy Returns, this had actual good gags. Wackiness of the characters were used well. It never felt too energetic. It knew when it needed to be so silly and the pacing was well-balanced. Plankton was so hilarious with yelling at scout girls to leave their spot (puns are good for your soul) and him threatening people to buy them. Despite how the plot moved was predictable, I really enjoyed how Plankton was explaining the plan, while Spot's pets were doing the plan. I was worried It'd go with explain the plan and then do the plan but they did both at the same time. Karen being so awww to Spot's babies was so cute and it was funny how she got cute overload lmao. Patrick still acting like a dog was a nice continuty and it didn't overstay it's welcome and It was pretty amusing. My biggest issue was lack of Spot, he should have been in this episode more and it didn't exactly reach emotional aspect of Plankton's Pet. Still I really enjoyed this and I'm glad Spot is still Plankton's pet with him being a dad/mom. Plus more SpongeBob/Plankton dynamic. Oh man, this is the best episode I've seen since The Whole Tooth! Spot Returns is a delightful treat. I was honestly surprised at how great this episode was. I expected it to be a hit or miss episode, like a lot of Season 10 episodes, but this episode pleasantly surprised me! The plot itself is creative, as I believe it does a great job at bringing back Spot, and actually making him useful. They don't taint his character either, he's the same old, sweet amoeba we all know and love from Plankton's Pet. The episode primarily focuses on Spot's puppies. That's right, Spot has kids! That was a surprising turn of events that I did NOT expect to see when I watched this episode. Excellent job on the writer's behalf. It was a refreshing way to use Spot. And it's not like he is "there to be there". No, he actually has an important role in this episode's plot. Now, I feel like I must address this before I go forward. The episode shadows Bubble Buddy Returns, and I mean, it REALLY shadows it. The title itself is even pretty much the same thing (By severe coincidence). The plot focuses more on the returning character's offspring, rather than the original character itself. But, here's where the two episodes differ. I believe that this episode is less predictable, and more enjoyable than Bubble Buddy Returns. How so? Well, for starters, Spot is actually essential to the plot. He gives birth to all these Amoeba puppies, which Plankton now has to figure out what he's going to do with them. Whereas, Bubble Buddy only appeared for nostalgia reasons. I feel like, if Bubble Buddy never appeared in Bubble Buddy Returns, the episode would practically the same, whereas this episode would've been much different in quality. Anyway, I really like how the writers approached this episode. They managed to take the cute factor from Plankton's Pet, and mash it with comedy. Plankton's Pet had a nice, cute little story, but it wasn't funny. This episode manages to mix both of those together in a really marvelous way. First of all, when Spot appears, we already get some funny jokes about how much bigger Spot has gotten since we last saw him. This sequence is entertaining, and is a great visual joke. It then sets up the plot when Karen informs Plankton that Spot is pregnant, and explains how (In a way that even taught ME something new). Plankton starts to panic, but too late, Spot already gave birth (Never thought I'd say that :nervoussponge: ). Eventually, Karen shuts down due to a cute overload (Which was interesting to see her break down when seeing the small little amoebas). Oh yeah, we get to see Spot one last time before he's gone for the rest of the episode, this time, appearing as his normal, lovable self. The puppies start causing chaos, and Plankton is confused as to why they aren't behaving like Spot. This scene is interesting to watch, I don't know, visually, it's just entertaining. Soon enough, Plankton mashes the amoeba babies together to create large amoeba puppies. I feel like this was done in a very creative way, and I really like how this scene played out. Plankton then tries to get rid of the puppies, and to my surprise it works! Well, it does for the time being. The puppies cause chaos at their new owners' homes, by destroying their houses, and stealing something, followed by them returning to the Chum Bucket. This was a nice plot point, as I honestly didn't expect them to straight up cause as much chaos as they did. Another twist I did not see coming! They arrive at the Chum Bucket, and Plankton realizes how great they are at stealing things. I really like this transition from Plankton trying to figure out what to do with these puppies, and him making a plan to steal the formula. I think this was done in a nice, natural way, rather than coming off as forced. This plot point was actually pretty interesting. While generally, I'd be irritate by the writers turning the episode into a "Plankton steals the formula episode", I saw great potential with him using the puppies to steal the formula, and I think it was a good call on the writers to make use of these characters to produce a great, new "Plankton steals the formula episode". We haven't had an original variation of this type of episode since CopyBob DittoPants, so I was looking forward to this (After the mediocre "Plankton steals the formula" episodes in Season 10, as well as some hit or miss ones in Season 9, except for Married to Money, but that concept wasn't original). Plankton can't train them, so whose he gonna call? So Plankton calls SpongeBob (Of course), and SpongeBob helps him train the puppies. This scene was awesome, I'm not going to lie, I really love this scene. I thought it was very entertaining, didn't go too fast, but didn't drag on either. I thought this part was a great climax sequence, I really loved watching it. The writer and storyboard artist obviously had a lot of fun writing this part, and if they didn't, boy, they are talented! Surprisingly enough, Plankton himself reveals his plan to SpongeBob, rather than SpongeBob getting some sort of hint that this is an attempt to steal the formula. This was interesting, considering the fact that this has never been done before in an episode, so I was actually pleasantly surprised how this scene turned out. Also, I really loved watching the puppies steal the formula. It was very entertaining, and well animated. Even though i could kind of tell they were stealing the formula, while Plankton was describing how they'd do so, I was a little skeptical thinking it was just Plankton's imagination, but no. The writer just moved things along, and got Plankton the formula. The way SpongeBob managed to escape was very creative, and the episode ended on a very satisfying note. So, as you're aware, I obviously love this episode. This episode is by far the best episode I've witnessed so far this year. It'll be hard to top this one. I really love this episode, I really do. I think this episode was funny, it was creative, it gave Spot an actual role in the episode (Though he could've appeared more), and there were a lot of twists and turns I didn't expect. You heard me, it's an Amazing Episode. After watching this, I was really excited about Season 11, because I have a really good feeling about it. Great way to bring back Spot. It seems like he's been there since Plankton's Pet but I'm sure he'll only appear for episodes that involve him. I also noticed the faces and movement felt more natural, like pre-movie but obviously more expressive. The only problem was that spot didn't really appear that often but it was still entertaining. Very good visuals and some nice gags with a quality story. It's really been a bold move that the SpongeBob crew's been doing so much to make every episode feel like part of the same world in Season 9 and 10, and having the adorable wittle Spot come back was a the biggest step in that direction yet. 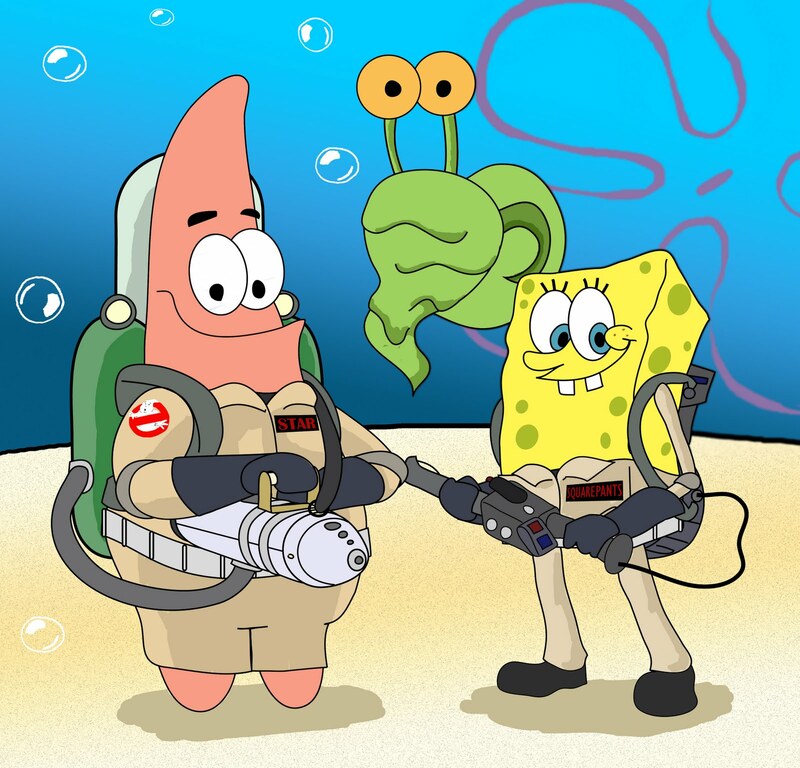 It could've been really risky given "Plankton's Pet" was one of the most universally loved episodes in recent memory, and if this episode was boring or failed to incorporate Spot into the story, it could've fallen with the likes of "Bubble Buddy Returns" as an episode so forgotten it's only brought up in arguments against the show having continuity. Luckily "Spot Returns" didn't disappoint. -Awww the amoeba puppies are just sooo cute! They're so tiny and helpless, and I just love that they form a conglomerate goo ball because they're single-celled. Karen was just spot-on with my feelings when she had her cuteness overload and rebooted for the rest of the episode! -"I COMMAND YOU TO TAKE AN AMOEBA PUPPY!!!" Plankton was just so over-the-top in trying to kill everyone that it was just hilarious. -The pacing is very well-done, scenes that could've been tedious were alleviated through really funny jokes. My favorite was the part where while Plankton was announcing his plan to steal the formula and showing it off, the puppies were doing it at the exact same time. Great time-saver! -It was silly to see SpongeBob training Plankton's puppies by acting like an amoeba himself. It's a memorable little sequence. -Did it really have to devolve back into Plankton stealing the formula and being foiled in the most generic way possible? The episode would've been a lot more interesting if it involved the new pets adapting to their new owners, or if there was more focus on trying and failing to sell them. The change in plot also doesn't make sense at all. Why do the puppies suddenly want to steal jewelry to bring to Plankton, why do these puppies even have personalities when they're days old and made up of hundreds of amoebas? Nothing's explained to ease this transition. I'll give it a "B-". It's nowhere near as good as "Plankton's Pet", as I'm sure the cuteness facade will die down pretty quickly upon a second viewing, and the cliched and underdone second act of the generic "Plankton steals the formula whoop-dee-doo" will stand out as a bigger problem. However, it's still an enjoyable start to a brand-new Season! Tbh I didn't think Plankton's Pet was nearly as worthy as the praise it received (Still a great episode but not even the best of season 9) and Bubble Buddy Returns was a rather disappointing misstep. Thankfully this episode managed to surpass my concerns. The whole thing was cute and funny while also standing as a strong story that doesn't rely on good will from Plankton's Pet. Spot himself should've appeared much more but that doesn't change how well-paced this episode was and how it was able to stand on its own unlike the lame reboot vibes Bubble Buddy Returns gave. Good episode, but I wish we saw more of spot then his puppies. I found this episode was alittle like bubble buddy returns where you don't see much of bubble buddy. Best episode I've seen of a reused concept. It was great! I really liked the story, flowed well. Krabs and Patrick's side jokes i found to be hilarious. Unfortunately the ending was stupid...cmon plankton. But yeah, 9/10. Several episode callbacks, the funny intro banter between Karen/Plankton, Krabs/Patrick having a fun little subplot, SpongeBob contributing to the episode in a positive and helpful way. Pretty much a solid episode. Even though it did have a same ol' formula scheme tied into it, at least that was only towards the end. In general I'm starting to really enjoy the "SpongeBob helps Plankton out" episodes. Good episode. Pretty cool that they got Spot back. Also, did anyone see Spongebob make the same bubbles from Bubblestand? Its one of the better episodes i've seen.. There were some nice throwbacks like Spongebob blowing the same bubbles from Bubblestand. It was a little bit of a grossout episode but I just have a overall weak stomach. I thought this episode was gonna be a flop but it isn't too bad. SpongeBob blew a "Giraffe" hahahhahahahahahahah. Also, there was a picture of Mr. Krabs on Mrs. Puff's mantle. Anyway, this was a pretty good episode. If only we saw more of Spot. But Plankton yelling at the Girl Scouts (but why did he turn down those cookies? Girl Scout cookies are amazing) was really funny, and he even shot someone who didn't want a puppy! Great episode though, 9/10. There was a bit of a pacing issue at the start, but otherwise was pretty good. This monster business isn't my thing. I didn't really like this episode, but I will tell you I'd react the same as Karen did with the slim puppies. Except for me it would be kitties.